Despite the consternation of the faithful, the closure of the cemetery of Saint-Médard in January 1731 did not destroy the Jansenist convulsionnaire movement - far from it, though one of the effects was undoubtedly to de-emphasise miracles of healing in favour of prophetic and charismatic gifts. In an effort to escape police surveillance, adherents dispersed into small gatherings in private homes and religious houses: within a few weeks they had spread into the suburbs of Paris and cells took root in the provinces - in Champagne, Lyon, Eure, Troyes and Auxerre. The groups kept alive the cult of the diacre Pâris through relics such as earth from his grave or water drawn from a well which had once belonged to him, so that private homes became "stations of the little cemetery of Saint-Médard". Participants were also mindful of the organisational example of the conventicles of the early Church. The faithful made a point of ignoring social rank; from 1732 onwards they generally adopted the appellation "brothers" and "sisters" usually using their Christian names or adopting a pseudonym, soeur Pélagie, frère Augustin and the like. Distinctions were based on "charismatic gifts" which defined the value of the particular individual within the collective work. As in so many similar contexts this tended to elevate the religious standing of women and young girls. Members were tied by strong emotional bonds and shared religious experience. A typical meeting might be attended by anything from a handful up to two dozen devotees, who would often prepare by undergoing long periods of penitence and fasting. Sessions usually lasted few hours, but on occasion could go on for a day or more in an atmosphere of sustained devotion and collective exaltation. Events developed spontaneously, but there was often a male ecclesiastic who assumed informal direction. A period of prayer and meditation would be followed by invocation of the Holy Spirit through the intercession of the diacre Paris, readings and explications of Scripture, and the recitation of psalms. 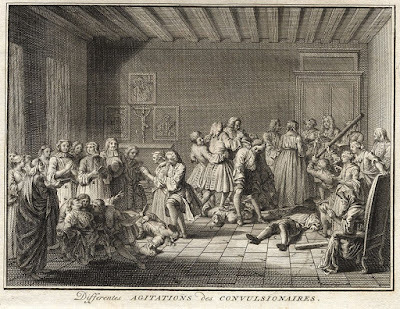 The oeuvre des convulsions encompassed a wide variety of different phenomena. At a certain point members of the group would break into violent agitations; they would roll around in a state of frenzy, screaming, trembling and adopting strange contorted postures, often grotesque and sometimes sexually suggestive. In the overwrought atmosphere excitement was readily communicated to others. The ability to experience convulsions was interpreted as a manifestation of the divine presence. It also inevitably gave attention to otherwise obscure individuals, some of whom no doubt suffering from various forms of epilepsy and psychomotor disorders. Within a year or so of the closure of the cemetery, several hundred people, mostly women, were experiencing seizures. A peculiar feature which developed within the movement of the 1730s was the practice of secours, a term which meant both "assistance" and "relief". The word was often used as a synonym for the convulsionary activity itself, but it referred more particularly to the part played by secouristes or assistants who aided the convulsionnaires. The role evolved gradually. At first it involved simple restraint, often for the sake of propriety, or efforts to alleviate the intense pain experienced by many convulsionaaries. In the so-called petits secours, participants were "assisted" by the application of pressure or moderate blows. Soon, however, the violent interventions of the secouristes became an important validating component of the experience itself. The controversial grands secours involved a seemingly bizarre variety of physical tortures - beating with heavy objects, application of knives, pins and pointed swords. Occasionally convulsionaries would be crushed under a board on which as many as a dozen people would stand or jump up and down. Others allowed themselves to be dragged around the floor or demanded to be choked or even crucified, all the while praying for the will to endure. Sustained by prolonged fasts and a heightened atmosphere of expectation, participants were capable of attaining ecstatic trance-like states in which they experienced little or no pain. They reportedly showed no signs of injury; on the contrary, they characteristically demanded more and more violent interventions. Then as now, such antics were widely condemned as exercise in attention-seeking and licentiousness; an underlying sexual motivation - albeit unconscious - seems credible in a context where female convulsionaries called on men to press and pull their breasts or to pierce their bodies with swords or pins. The secours took on a life of its own and soon assumed the appearance of masochistic torture. As Krieser emphasises, the vast majority of participants were sincere in their religious motivation. The sessions were also carefully controlled. Success depended on the proper management of the secours, which in turn required a close trusting relationship between the convulsionary and his secouristes or valets de chambre. The secours give those who experienced them, not merely relief, but a tremendous sense of interior consolation and divinely-infused joy. The secours were interpreted as signs which God had chosen to prepare the followers of the diacre Pâris to receive and announce sacred truths. Like the cures, the miraculous invulnerability of the convulsionnaires served as irrefutable proof of divine election. According to"figurist" interpretations the grands secours or secours meurtriers were a form of divine witness intended to instruct both the participants themselves and their "malevolent" enemies. They served as living tableaux of the turmoil within the Church, with the convulsionaries representing the righteous defenders of Truth and the secouristes their tormentors and oppressors. In this way they also recalled the persecution that had preceded God's deliverance of His people in the days of the First Christians. Some adepts even went so far as to act out "figurative representations" of Christ's suffering and crucifixion. The example of the Early Christian martyrs, and of François de Pâris in present times, confirmed that it was possible to triumph with Jesus Christ only through suffering. The movement was shot through with apocalyptic expectations. The convulsionaries believed they were figuratively sacrificing themselves to assuage God's anger in a period of confusion which heralded the Last Days. They were the spiritual precursors and forerunners of Elijah who, at some unspecified time, was to return as one of the witnesses against Antichrist and as a herald of the Messiah. According to Montgeron God had specifically designated them "to prepare for this great event by penitence and prayer" (Vol.II "Idée de l'état des convulsions", p.5). Nonetheless, as Kreiser emphasises, the secours were only one of a number of forms of witness. Large numbers of cures continued to occur, most of them attributed to the intercession of the diacre Pâris . There was also much babbling and "speaking in tongues". This could include blasphemous utterances: one woman reportedly threw a Bible on the ground and stamped on it, supposedly as a dramatisation of the "horrible profanations" suffered by the Jansenist faithful. The more coherent ecstatic discourses were taken down by copyists and circulated in printed and manuscript recueils. Most of those that survive are relatively simple and uneducated, but some show surprising eloquence and extensive knowledge of scripture and theology. They too were infused with Millenarian imagery and a sense of impending martyrdom. Police spies at first merely kept a watchful eye on activities, but soon moved into active suppression. On 17th February 1733 the Council of State issued an ordinance condemning those who "by a spirit of imposture" pretended to have convulsions, made a spectacle of themselves in private houses"to abuse the credulity of the people" and "gave birth to fanaticism already too widespread". The members of the movement were now harried and imprisoned. Between 1732 and1774 176 individuals were sent to the Bastille, 74 to the Grand Châtelet and 300 to Vincennes. 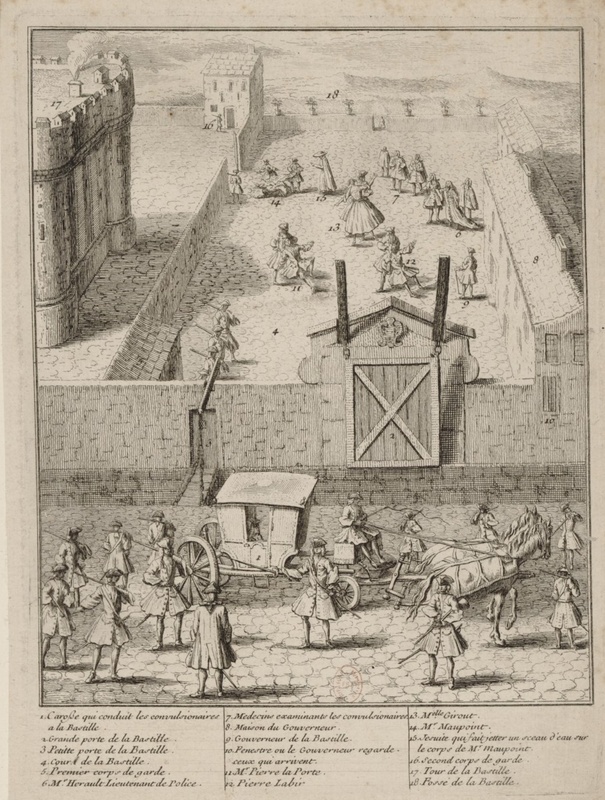 Many were also incarcerated in the Bicêtre, or, for women, the Salpêtrière. The convulsionary phenomenon survived only in a much curtailed form after 1735.